Luke Miller Buchanan is a Raleigh, N.C., artist who has gained national notice with his mixed media paintings. Depicting phantom spaces framed by derelict buildings and structural detritus, Buchanan’s visual storytelling finds creative treasure in the forgotten histories and “spiritual residue” that remains. In 2010, Buchanan was showcased in the prestigious art journal New American Paintings (issue 88). Born in N.J., Buchanan’s family moved to Raleigh in 1988. He attended Enloe High School and the North Carolina State University College of Design, majoring in architecture. Today, the downtown Raleigh Boylan Heights neighborhood denizen is a working artist, in demand for large-scale murals as well as his original studio work. He can also be found behind the bar at passionate mind and chef Ashley Christensen&apos;s Poole’s Diner on certain nights, making folks happy with his mixological handiwork. I spoke recently with the multi-talented Buchanan to learn more about his work, his inspirations and the power of the peanut butter and jelly sandwich. During school I worked for master woodworker Anthony Ulinski at Dovetail Woodworks. I cannot overstate how important this job was to my future career path. After I graduated from North Carolina State University in 2002, I went on to work for four years at the North Carolina Museum of Art in the design department and left the job to focus on my painting. I then met (chef) Ashley Christensen in 2006 and have been working with her ever since. In 2013, I was asked by James Goodnight to restore the Royal Crown Cola sign on the side of the Nehi Building (on Hillsborough St.). Since then I have gotten a lot of work painting murals, but my focus is still studio painting. Describe your work and the media you utilize. I mostly work in mixed media. Collage, painting, photography and drawing all contribute to my work. I focus on forgotten spaces and the memories of individuals&apos; experiences in these spaces. I currently have work up at the Block Gallery at Raleigh Municipal Building [through July 22] and at Peregrine Projects. I am planning a large solo show for the late fall which will probably be at my new studio on S. Bloodworth St. I have a number of murals that anyone can see any time. I mentioned the Nehi Building sign that I painted. 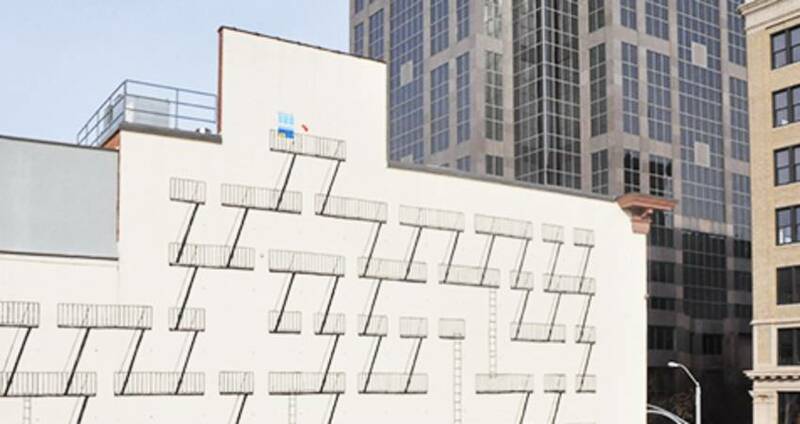 I also did the large Fire Escape Maze mural on the south wall of Death & Taxes (pictured in header). Most recently I painted the "All Are Welcome" mural on the side of the old tire shop next door to Poole&apos;s. I have gotten a lot of positive feedback on that one. Currently, I am working with Gary Bryant on H-Street Kitchen, which will be opening soon in the old Varsity Theater on Hillsborough St. I am doing several paintings from archival photographs as well as two murals inside the building. Music is number one. I read a lot. I basically consume all types of media and see what sticks. Sometimes an idea will be in my head and I&apos;ll have to turn it into a painting to try to understand it. I am also inspired to paint by places/spaces. Mostly run-down old buildings because I feel that they have a story. That&apos;s not as important to me as knowing that it is there. Bill Watterson jumps to mind. I got started drawing by re-drawing Calvin & Hobbes comics out of the newspaper. David Hockney, Wayne Thiebaud and Richard Diebenkorn as far as painters go. My teacher Lope Max Diaz (from North Carolina State University) is a hero of mine as well. He has continued to be a huge supporter and a great friend to this day. What’s Raleigh like for a working artist? Any local artists that you recommend checking out? It is getting a lot better. I still think that there is work to be done, but there are a lot of talented people doing just that. My dear friend Shelley Smith has done wonderful things for our community with her Pink Building Project. All of my friends in Peregrine Art Projects, of course. I like that Raleigh is small enough that you feel like you know everyone, but big enough that you constantly meet new people. Kings is at the top of the list. As well as Garland and Neptunes Parlour. I spend a lot of time in that building and it is full of great people. All of the Ashley Christensen Restaurants, of course. I&apos;m a big fan of Trophy Brewing Company, the pizza place and the newly-opened brewery. Any local bands that you like? Other than my friends and family there is nothing I love more in the world than music. My favorite local band is my brother Sean Buchanan&apos;s band Colossus. They have as much fun as the crowd and they are all amazing musicians. There are really too many to name but I will say I almost never miss a Heads on Sticks show, and you shouldn&apos;t either! What nights do you work at Poole’s? My schedule shifts around from week to week but I am almost always there on Fri. nights. I will make you any drink you want. It doesn&apos;t matter to me what I like to drink it matters what you like to drink. I love to talk to people and help them figure out what will make them happy. That being said, when I go out I will probably ask for a cold draft beer and a bourbon. Favorite thing chef Ashley Christensen makes? I don&apos;t think it is cheating to say everything. She made me a peanut butter and jelly sandwich once that I will never forget. I don&apos;t think it matters what she makes, it&apos;s how she makes it. She really cares, and it shows. I am a better painter, a better bartender and a better person because of her. That might sound like a little much, but if you know her you will understand. What is your creative philosophy or mantra? Never refuse a reasonable invitation.